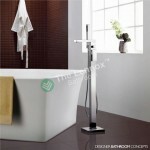 The stylish modern wall mounted thermostatic bath shower mixer with bottom outlet. 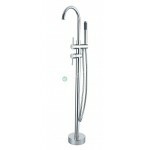 Modern styling with chrome finish and constructed from solid brass. Can be easily offset by holding down the safety push and click button on the handle. 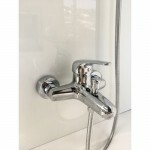 Tap has built-in diverter for switching between tap and shower. Supplied with decorative shrouds/covers to protect and conceal tile/wall edge, giving the installation a neat finished appearance.